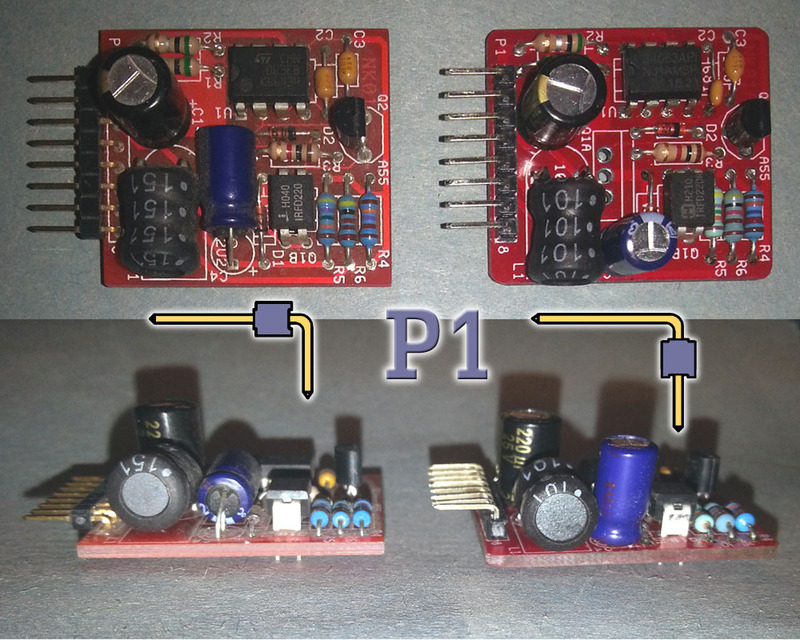 This kit allows you to build a regulated switch-mode power source, that will convert a, nominal, 12VDC input up to any voltage from 45V to 190V. 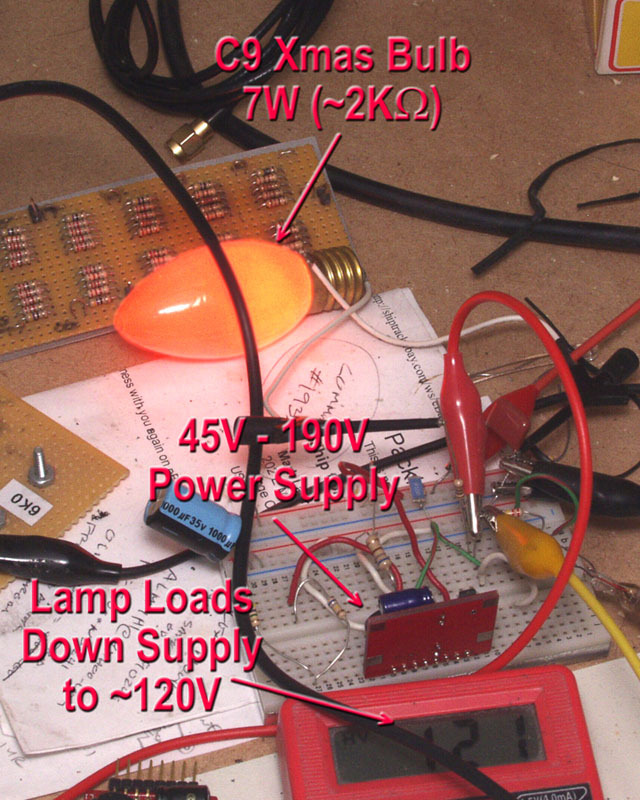 With the components included in the kit, it can output 5W of power, with an average efficiency of 75% (or ~6.7W in). The difference of 1.7W (6.7W – 5W) will escape as waste heat. 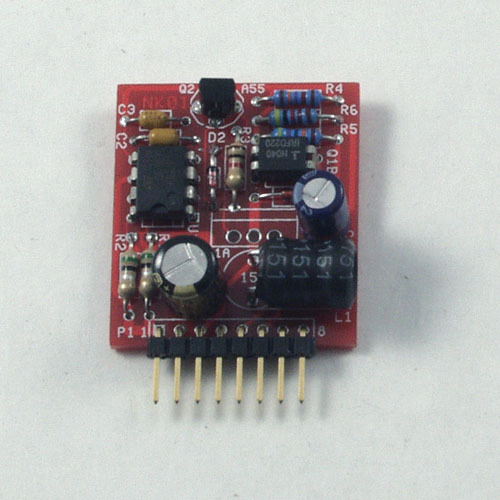 Note: 5W output is based on a 12VDC input. A higher input voltage, will yield a higher possible maximum. For example, an input of 16V, should allow a maximum of 6.5W, or more than 36mA at 180V out. Maximum recommended input voltage is 18V. March 15, 2017: Release of NK01B (Revision B). Same parameters as NK01A. Parts rearranged to reduce size to 1.2″ x 1.2″ (30,5 x 30,5mm). Only one Q1 position to accomodate a TO-220 or IPAK (TO-251AA) package. Sept 12, 2013: The NK01A (Revision A) has been released. The output has been increased. Its recommended that the maximum output should be 5.5W, though its been tested and survived with an output of 6.4W. As noted, above, if a 16V supply is used, the maximum suggested output can be upto 7.2W. Note: D2 comes pre-installed on the board on the older (non-A) version. Not pre-installed, on the current “A” version. Please be careful, not to mix up the two glass (TO-35) diodes. D1 is the BAV21, and will have taped labels on the leads. D2 is a 1N4148 (1N914). D1 is faster, but D2 has the higher PIV rating. The circuit is based on the Motorola MC34063 switch-mode controller chip. This chip, has been available since the 80s. The circuit is a basic Boost Supply, where a single winding inductor is used. It works by storing energy in the inductor. This energy is proportional to the square of the current flowing thru the coil. Current is allowed to flow thru the current, by switching Q1 “On”. An inductor won’t allow an abrupt change in current, so if the switch, Q1, was “off”, the current will ramp up from zero. Ideally, when the current reaches the maximum the coil can handle (called the saturation current), Q1 should be switched “off”. Again, the current can not change abruptly. When turned “off”, the inductor will dump its energy (stored in its magnetic field). It will ramp down, from that maximum current. Its only path is thru D1, and to get maintain that initial current, the voltage, will abruptly rise to some high value. (note: to the newbies: voltage and current are two different things. Related, but different) Voltage is pressure, while current is flow rate. In this circuit, the maximum current, is roughly timed out, by the selection of C2. The voltage is regulated by a network of resistors (R4, R5, & R6), plus an optional RX. RX is used when any voltage other that the supplies two extremes (45V:open, or 190V:shorted) is desired. The schematic shows resistor values for other voltage selections, and a formula, if you want something different. RX is connected across pin 6 and GND (circuit common, either pin 2 or pin 8). This circuit is also the MK1.5 (mark 1.5) version, of the MC34063 “nixie supply”. The addition of D2 and Q2, allow this circuit to quickly switch Q1 (the power FET) “ON”, and more importantly “Off”. In so doing, it is a vast improvement over the MK1 (mark 1) designs, floating on the web. The MK1 designs are only good to about half the power of this kit’s circuit. Towards the bottom of the parts list are more value options for RX. Note the maximum output current. This supply outputs 5.5watts. So at a lower voltage output like 45V, it can deliver up to 120mA. This maximum current available drops, as the output voltage is set to a higher value. At 170V, the minimum value used in most nixie clocks, it can only deliver 32mA. This is still adequate for a 6 digit IN-18 clock, since each of those tubes drawing 4mA (recommended minimum), will draw 24mA total. D1 is labelled BAV21, but a MUR140, HER105, or UF4007, will work just the same in this application. Primary concern is a part that’s rated for at least 200PRV, and with a switching speed faster than 75nS. If it meets these two specs it will work. Likewise, with D2. Any fast general purpose diode will do. Main importance is that it switches faster than 25nS. PIV rating is unimportant. 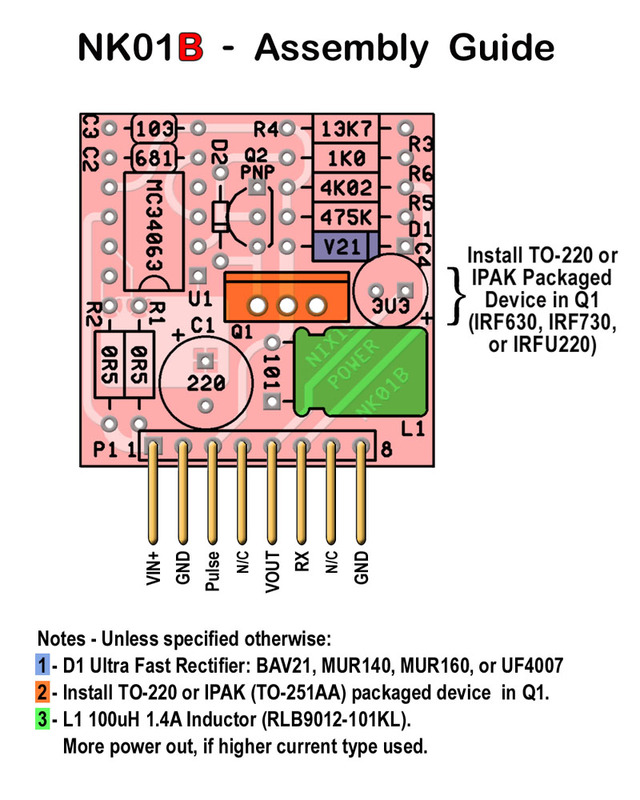 As of the January 2016, a 3.3uf 200V cap will be shipped as C4. This replaces the 2.2uf cap in the drawings. Higher ripple current handling accompanies higher capacitance. So this is an improvement. Observation: Sept 9, 2016: It has come to my attention, that some people think the dashes on the, P1, connector, pins 4 & 7, are minus signs, hence “returns”. THEY ARE NO CONNECTIONS ! The electronics convention, for the circuit “return”, is ground (GND) or common (COM). You hook up the input voltage across VIN+ and GND (pin 2, 8, or both). You hook up your high voltage load across VOUT and GND. You hook up Rx across Rx and GND. Everything is “referenced” to ground. It is the circuit common, and may be called: Ground (GND), Common (COM), or Reference (REF). The board has locations for two package types of power FET, a TO-220 (at location Q1A), and 4-pin DIP (at location Q1B). Only one type of FET is provided with the kit, and only one FET should be installed. The other location should be left open. The output can be increased from the 5.5 watts, if a beefier coil (L1), is used. The coil (inductor) provided, can handle a maximum input current of 1.4A. If a higher current coil (given the same inductance), is used, then the output power will be increased. Also note, a higher current FET, may also be needed, and the value of C2, may need to be increased, to allow the coil to ramp up to the higher current. R1 and R2, may also need to be shorted, since they offer over current protection, which will also limit the coils max current. As of the release of revision B (NK01B), there is only now one Q1 location, for TO-220, or similar power FET packages. The Ultrafast rectifier, D1, can be one of several types. A BAV21, which comes in a small DO-35 glass package, and looks just like the 1N4148 (D2). Please do not mix these two up. The BAV21 should come with taped labels on its leads. This location can also fit the larger DO-41 package. The MUR140 and UF4007 come in the DO-41 package. So does the 1N4007. But don’t confuse a UF4007 with a 1N4007. They are two different parts. This supply needs ultrafast rectifiers like those recommended. The 1N4007 switches at way too slow of a rate. P1 is a single row 8-pin right angle header. The plastic separator frame, may come in two styles. One with the separator on long pins (left), or the other, with separator frame on the short pins (right). Note, in either case, the short pins are to be inserted in the PCB, while the longer pins extend to the outside world. The style on the left, will be the type shipped most often. Normally, Rx, is added to R6. R6+Rx are in parallel to R4, which form the feedback voltage divider. This determines the output. Its been designed to range from 45V (open) to 190V (short), just using an additional resistor, Rx. But if a voltage is applied to to pin 6 that exceeds 1.25V, the output will drop below 45V, to maintain the 1.25V value, at the node where R4, R5, and R6 join. 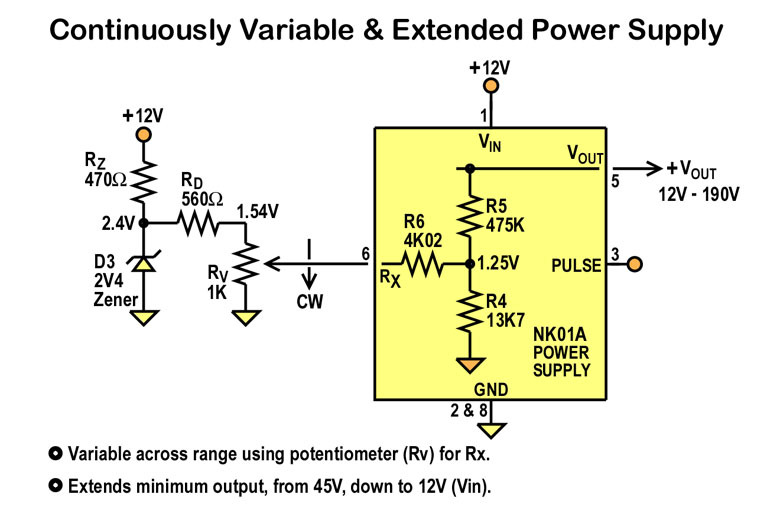 If its raised to ~1.54V, then the supply essentially shuts off, because the output will equal Vin (~12V). Replacing Rx, with the potentiometer, Rv, two associated resistors Rz (470), Rd (560), and a 2.4V zener diode, D3, will achieve this function. IMPORTANT: This is NOT the older (non-“A”) kit version, but the pre-assembled surface mount version, and the new “A” version, on sale as of Sept 12, 2013. 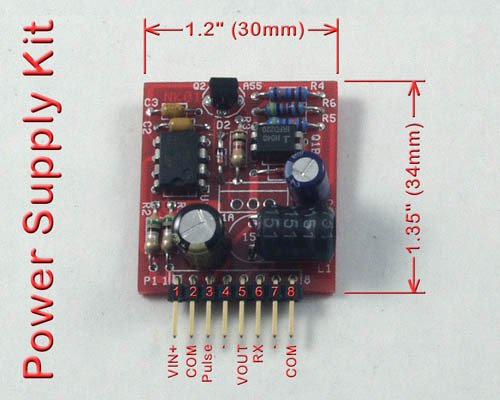 The pre-assembled version can output 7 watts of power (6 watts recommended max), while the older kit can only output 5 watts, with the parts shipped in the kit. The new “A” version kit, can output over 6W, while only 5.5W is recommended. To check how good competitors are, connect their output to a C7 Christmas light, and walk away for a few hours. See if its still working, when you come back. You can also try this with the new “A” version kit, but not the older (non-“A”) kit. Its not as beefy !